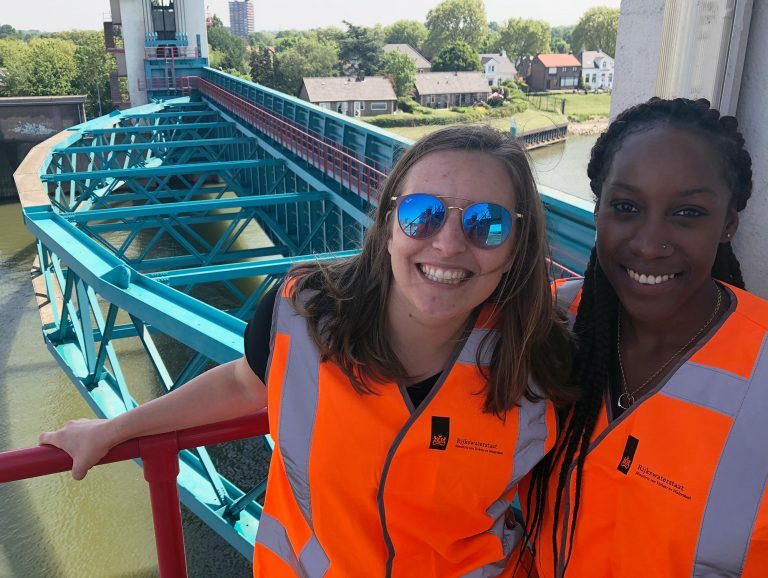 Sabrina Welch of Jackson State University visited The Netherlands as part of a project where she learned about flood-control innovations. Photo submitted. 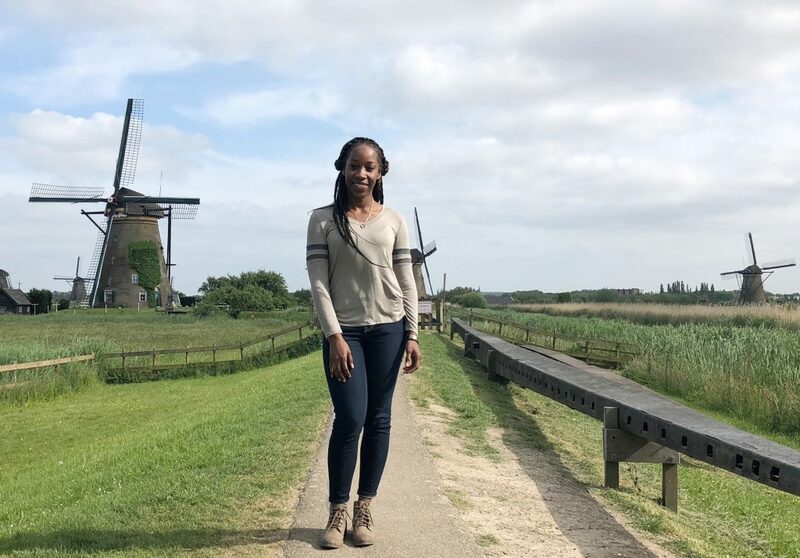 Sabrina Welch, a PhD student in coastal engineering at Jackson State University in Jackson, Miss., had the opportunity to travel to The Netherlands this past summer as part of the National Science Foundation-funded Partnerships for International Research and Education (PIRE) project, led by Texas A&M University-Galveston. CRC co-PI Dr. Bruce Ebersole was also part of this trip. The trip, which is part of a project called “Coastal Flood Risk Reduction Program,” involved research and site visits related to flood risk mitigation strategy. Welch met experts regarding her selected research project, working with a Dutch mentor to investigate solutions related to coastal flooding. Welch, right, visited the Maeslantkering storm surge barriers, which contains a two-armed flood control system spanning 360 meters (1,180 feet) across. Photo submitted. Among the sites Welch visited was the Maeslantkering storm surge barriers, which contains a two-armed flood control system spanning 360 meters (1,180 feet) across. She worked with students from several Texas-based universities and Delft University of Technology in The Netherlands to approach theoretical challenges based on Dutch infrastructure, such as controlling flooding while maintaining tourism appeal for a site. Welch also learned about green roofs, flood-proof homes, dune-covered parking decks and water squares – multipurpose spaces in urban areas designed to collect floodwater runoff. Welch was given the opportunity to speak at October’s I-STORM Annual Meeting in London, where she will speak about her experiences in The Netherlands and her PIRE research. 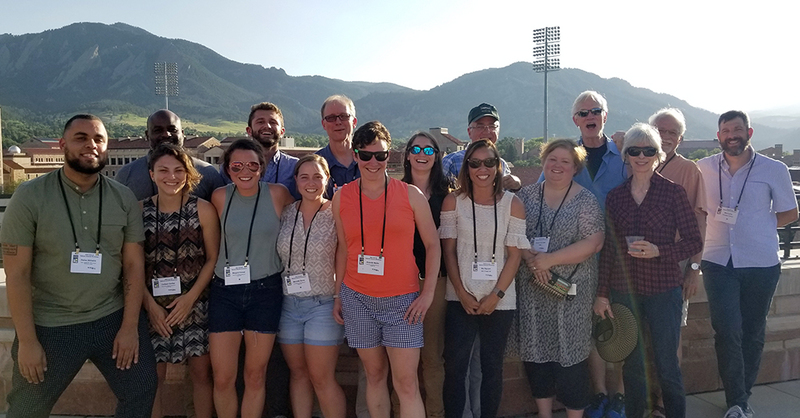 CRC students, researchers and Advisory Board members were part of the Natural hazards Workshop in Colorado this summer, where a group presented on an upcoming CRC report. Front row includes, from left: Students Darien Williams Colleen Durfee, Margaret Keener, Meredith Burns, Amanda Martin and Dr. Mai Nguyen. Back row includes, from left: Advisory Board member John Cooper, student Christian Kamrath, Dr. Gavin Smith, student Nora Schwaller. Also included is CRC researcher Dr. Phil Berke (back row, third from right). Photo submitted. Recent Education and Workforce Development grant recipients and master’s graduates Colleen Durfee and Darien Williams attended the Natural Hazards Workshop in Colorado and served on a panel discussing research on resilient design education, part of a CRC project led by Director Dr. Gavin Smith. Durfee and Williams, former UNC students, are continuing on to work as a planner in University City, Mo., and to a PhD program at Massachusetts Institute of Technology, respectively. Last summer, for the second year, Tritinger worked at the U.S. Army Corps of Engineers’ Engineering Research & Development Center’s Coastal Hydraulics Lab. 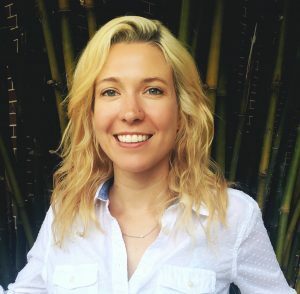 She worked with a dynamic numerical modeling prediction tool, the Coastal Storm Monitoring System, to create ways to help end-users better interpret model results. She hopes to use the results of that work to improve near-shore surge modeling with Dr. Resio. Rowshon Jadid with his poster at the 2018 COE Summit in Arlington, Va. Photo by Josh Kastrinsky. Jadid, a PhD student working with CRC co-PIs Dr. Mo Gabr and Dr. Brina Montoya at North Carolina State University (on a project that was led by Dr. Victoria Bennett of Rensselaer Polytechnic University), won a student paper competition organized by the Association of State Dam Safety Officials last spring. 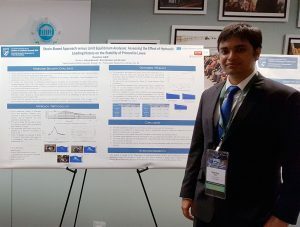 The title of his paper was “Deformation-based versus Limit Equilibrium Analyses to Assess the Effect of Repeated Rise and Fall of Water Level on the Stability of Princeville Levee.” He also presented his poster at the Centers of Excellence Summit held in May and will present during Dam Safety 2018 in Seattle. Jessamin Straub participated in the AMS Policy Colloquium in Washington, D.C. Photo submitted. Straub is a graduate student at UNC-Chapel Hill who is part of an education program led by CRC Director Dr. Gavin Smith. 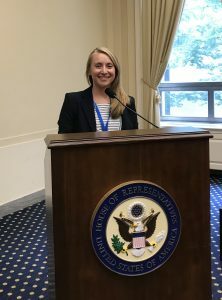 She was selected to be part of the American Meteorological Society Summer Policy Colloquium, where she learned about how science can influence federal policy. Held in June, the Colloquium offered students the chance to meet policy-makers on Capitol Hill, federal agencies, non-governmental organizations and the private sector. Straub wrote about her experiences in a CRC blog post. Kamrath, a recent Master’s graduate from UNC-Chapel Hill who was part of an education program led by CRC Director Dr. Gavin Smith, was hired as a Coastal Management Specialist with the North Carolina Division of Coastal Management. He will work from the Morehead City, N.C., office, helping local governments address hazards-related challenges. “The insights and opportunities [CRC] exposed me to played a critical role in my success at graduate school, my ability to get this job and will serve me well throughout the rest of my career,” Kamrath said. Kamrath has also worked on a project at UNC studying the fiscal impacts of federal buyouts of flood-damaged properties in eastern North Carolina. He also worked with the Hurricane Matthew Disaster Recovery and Resilience Initiative, which included the Princeville Design Workshop. 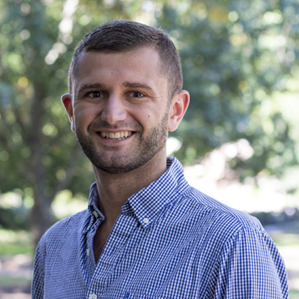 Fishman, a recent Master’s graduate from Duke University, was named a National Oceanic and Atmospheric Administration Coastal Management/Digital Coast Fellow in June. She will work with the Washington Coastal Zone Management Program, focusing on coastline erosion on Washington’s Puget Sound. Fishman, who was part of a CRC education program led by Dr. Smith at UNC, is one of nine fellows to be named to the program. The NOAA Office for Coastal Management and the National Sea Grant College Program sponsor the fellowship. Acevedo-Marerro and Santiago-Hernández, civil engineering undergraduate students at the University of Puerto Rico at Mayagüez, participiated in CRC’s SUMREX exchange program this past summer. They worked with PI Dr. Dan Cox at Oregon State University (OSU) to build a 1:6 scale house for use in OSU’s wave lab, where researchers are trying to develop a more accurate method of creating damage and loss estimates for structures impacted by overland waves. The students performed quality control on data from the wave lab tests and developed a digital house model to test their conclusions. Santiago-Hernández said the experience will translate to his academic work in Puerto Rico. “This experience definitely encourages me to pursue graduate studies in the field of coastal engineering, because coming from an island you know how this field can really make a positive impact on people,” he said. Acevedo-Marerro also said the opportunity will help with his graduate research. “This summer internship helped me to explore more about grad school and how this can expand my opportunities in civil engineering to improve my personal and professional aspirations,” he said. Huston, a recent Master’s graduate from UNC-Chapel Hill who was part of an education program led by CRC Director Dr. Gavin Smith, was recently hired by the Triangle J Council of Governments, a group that addresses cross-jurisdictional planning issues in central North Carolina. She will be a Planner II in the Regional Planning Department, supporting efforts across the region relating to land use, transportation investment, housing affordability, and energy and environment.